There’s this thing that keeps happening at my house over and over again. My three boys have a birthday—every…single…year. 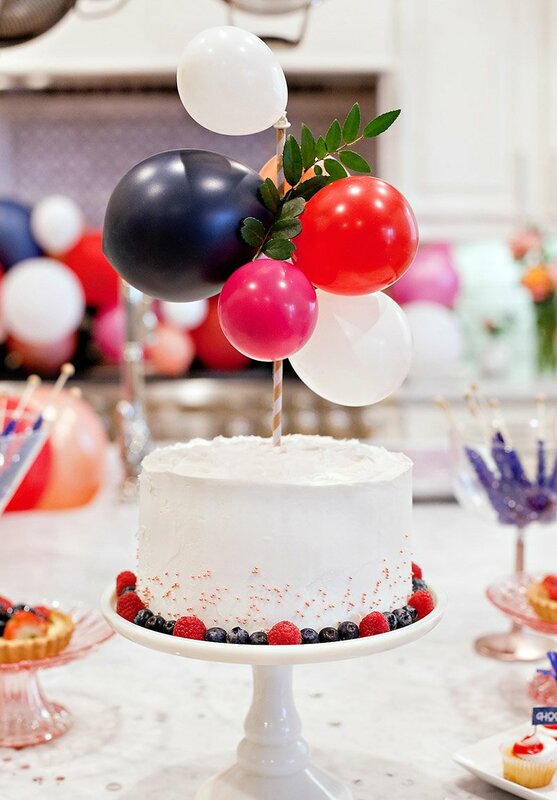 And while I LOVE hosting a special birthday bash for each of them—you know, something a bit more inspired than just choosing something from the party isle—I don’t have a lot of time to spend on each party. Sound familiar? 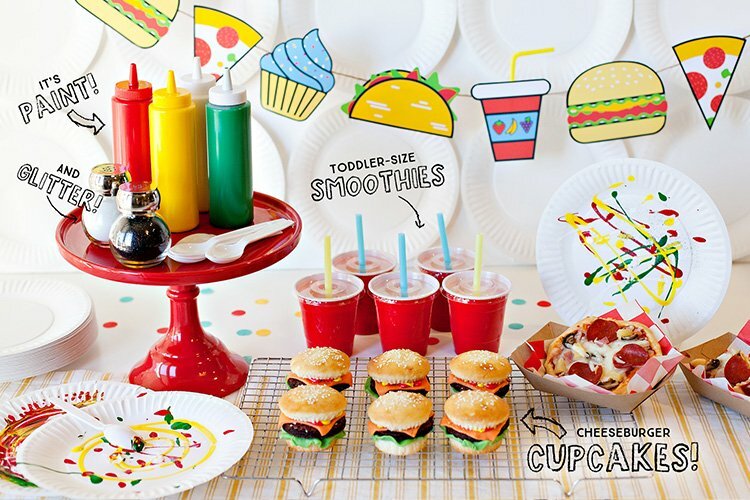 I’ve created PipPipHOORAY party plans so that busy moms can throw a special birthday party without investing too much time. 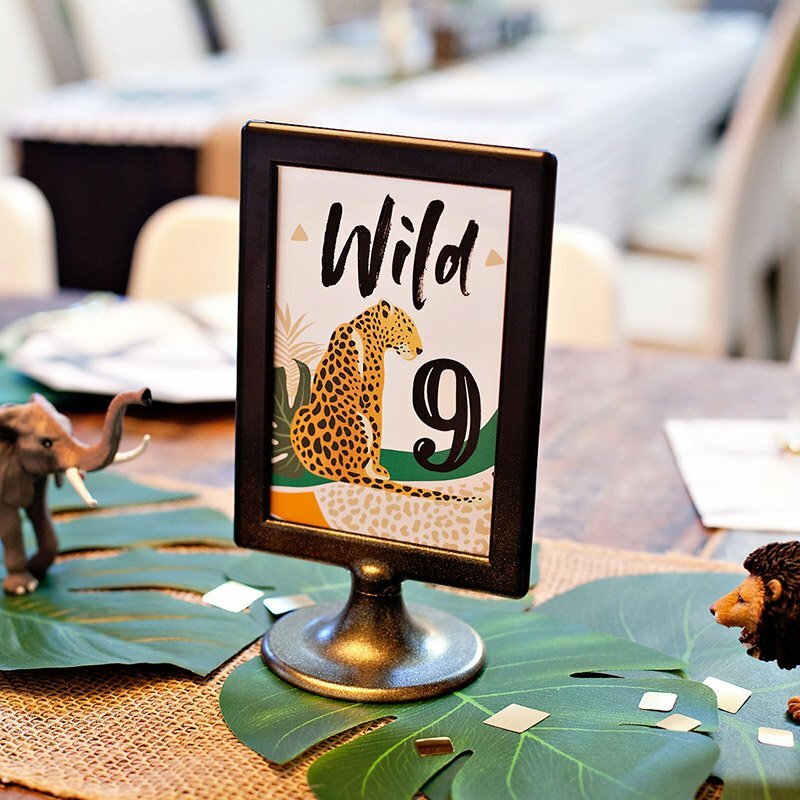 Each plan includes EVERYTHING YOU NEED—instructions, pictures, shopping and to do lists—to cover every detail of the party from start to finish. There are a slew of ideas to choose from. Feel like doing three or four? Great! Inspired to tackle them all? Go for it! Either way, awesome really can be easy. 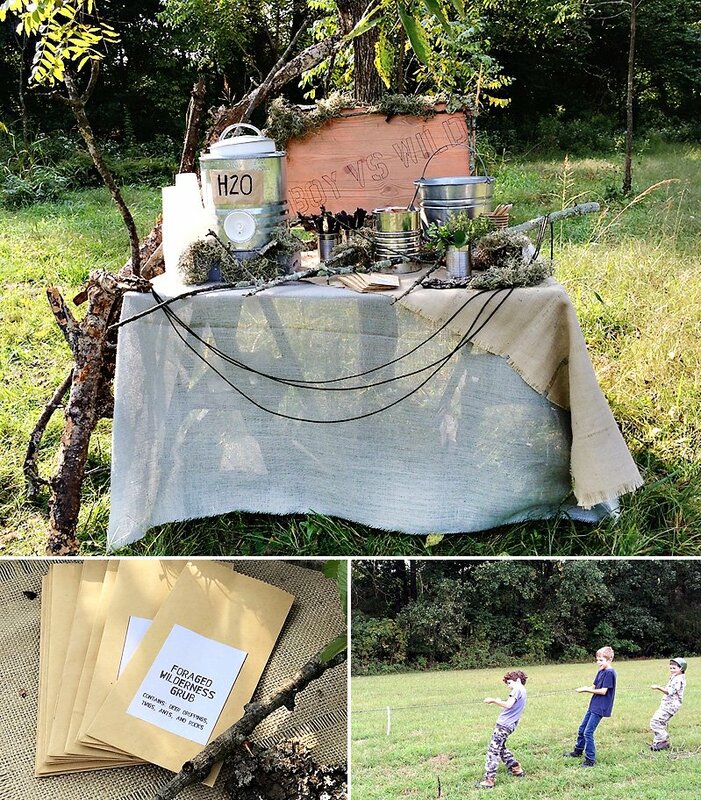 I recently hosted a BOY vs. WILD outdoor survival party for my eight-year-old adventurer. It was a blast! Imagine…these guys are in the middle of nowhere. Their only resource is their wits. How will they survive? 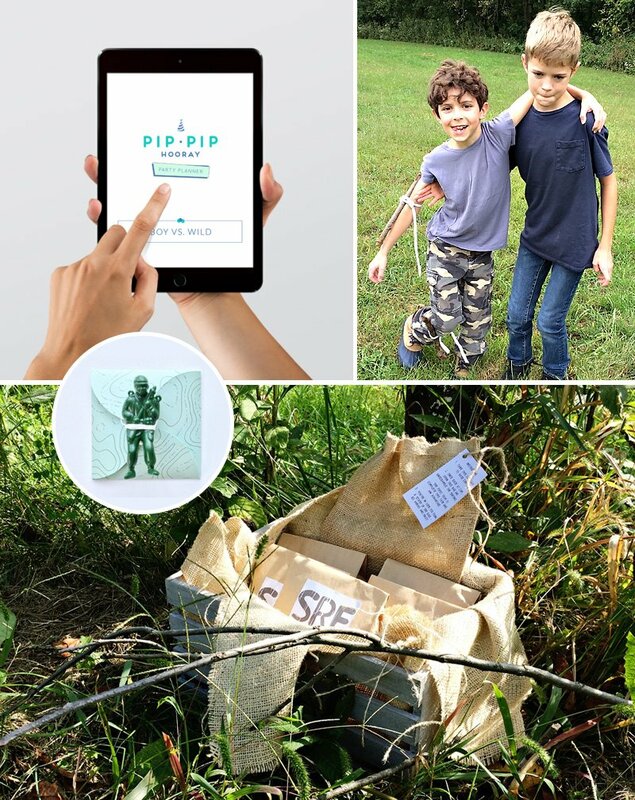 They were tested—both physically and mentally—in team tug of war, a first aid trek, animal tracking, shelter building, and a foraged foods challenge. 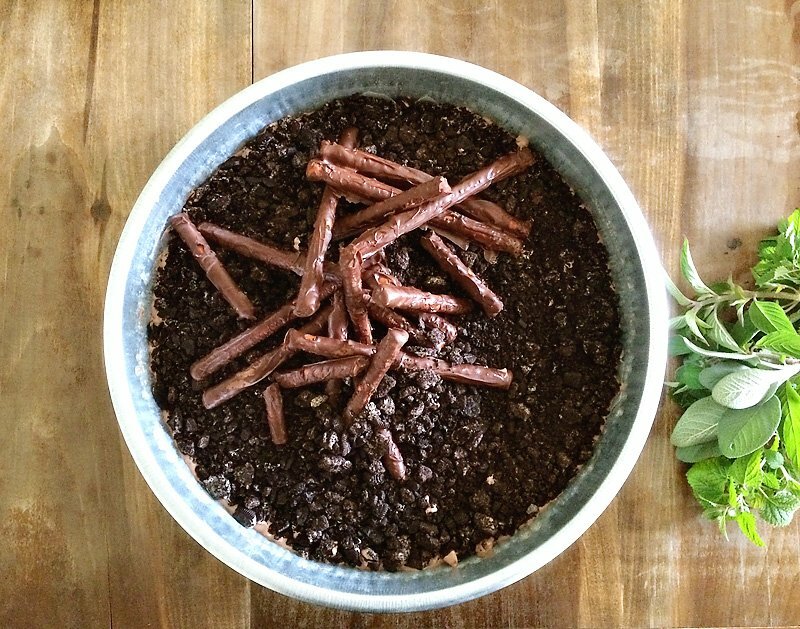 So after enduring all of that, I ﬁgured that these guys deserved something special…Dirt Cake! 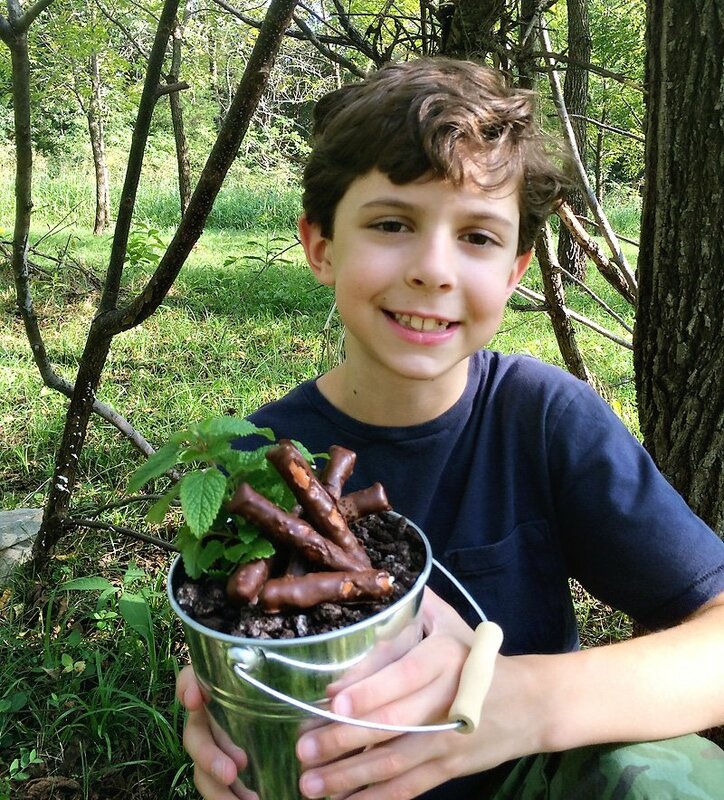 Could there anything better for a fun, outdoor treat? I don’t think so – just the name itself makes me smile. As you dig into the crunchy, chocolate dirt topping and down into those layers of ooey, gooey chocolate, you realize that this cake is almost perfect, especially for some sweaty, hungry boys. 1. Make chocolate pudding according to the recipe or the instructions on box. 2. Using a spatula, fold in the tub of whipped topping into the pudding. Chill until ready to assemble the cake. 1. Place all of the Oreos into a sealed plastic bag. Use the rolling pin to crush cookies into small pieces to look like dirt. 1. Pour chocolate chips into glass pie pan. Microwave on medium power for 25 seconds. Remove pan from microwave and stir chocolate chips with spoon. Continue this process of heating and stirring until chocolate chips are melted and completely smooth. 2. 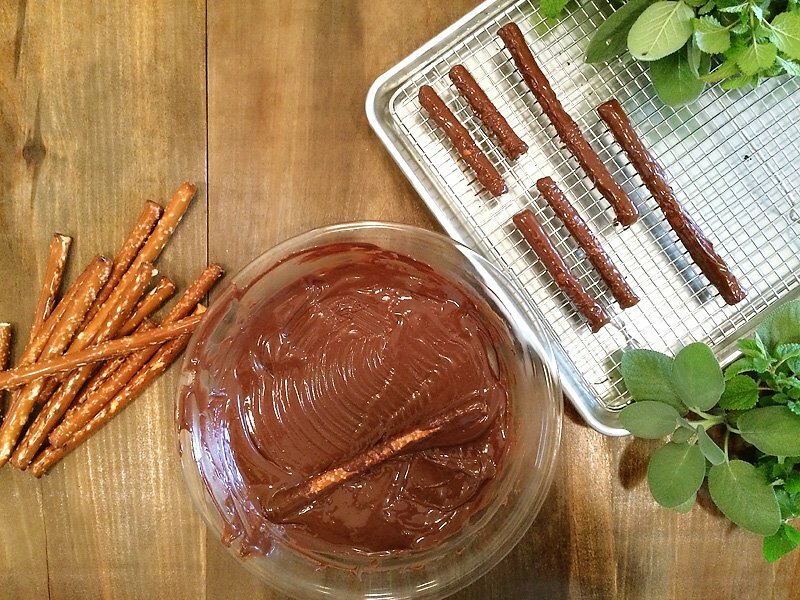 Place one pretzel rod into the melted chocolate and turn until completely coated. Remove from chocolate and place on rack or wax paper to harden. 3. Repeat Step 2 until all pretzel rods are covered in chocolate. It’s a good idea to break some of the sticks in half before coating them. 1. Clean the metal bucket well and dry it. 2. Cut your brownies into squares, and then completely cover the bottom of the bucket with a single layer of them. 3. Cover the brownies with a layer of the chocolate filling. 4. Repeat the layering of brownies and chocolate filling until you fill the bucket. You should end with a layer of the chocolate filling. 5. 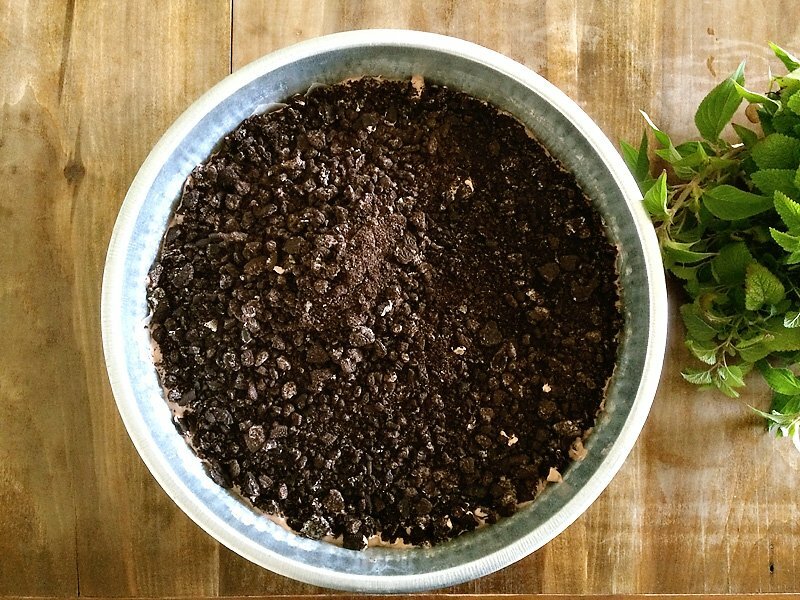 Spread the crushed Oreos (dirt) over the final layer of chocolate filling. 6. 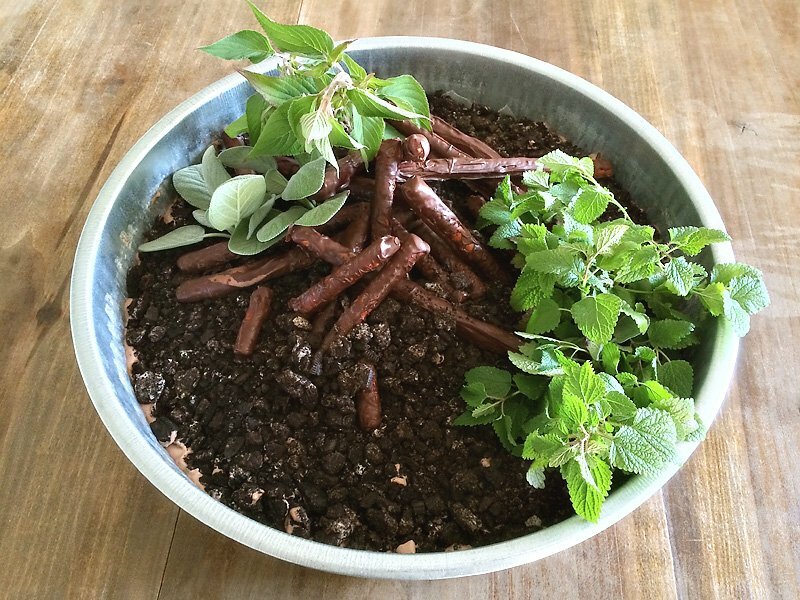 Decorate by placing chocolate sticks into a pile and arranging the herbs to resemble a forest floor. This does not have to be exact—just have fun and do what you think looks good! This cake can be made one day ahead and refrigerated. Add the fresh herbs right before serving so they don’t wilt. To make a large cake like the one pictured, you will need to double the recipe. 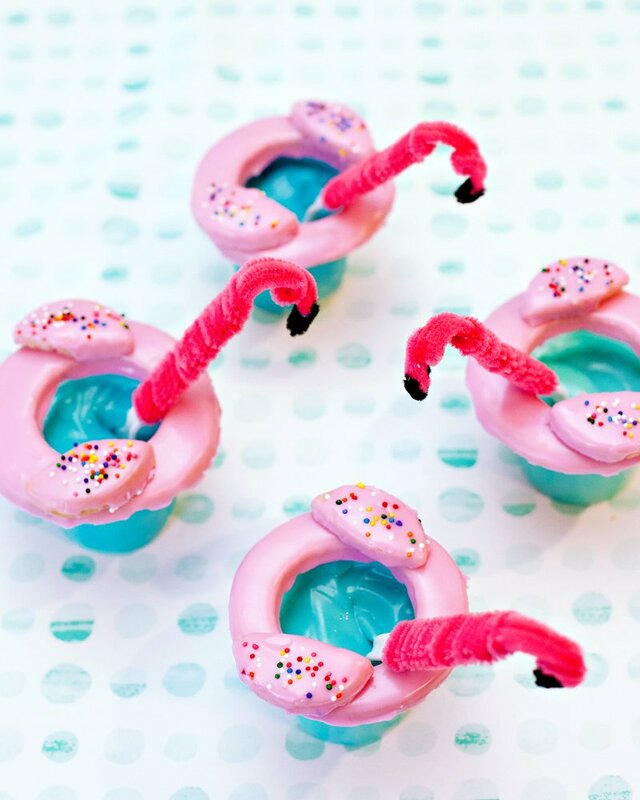 Or, use smaller buckets to make individual size cakes. 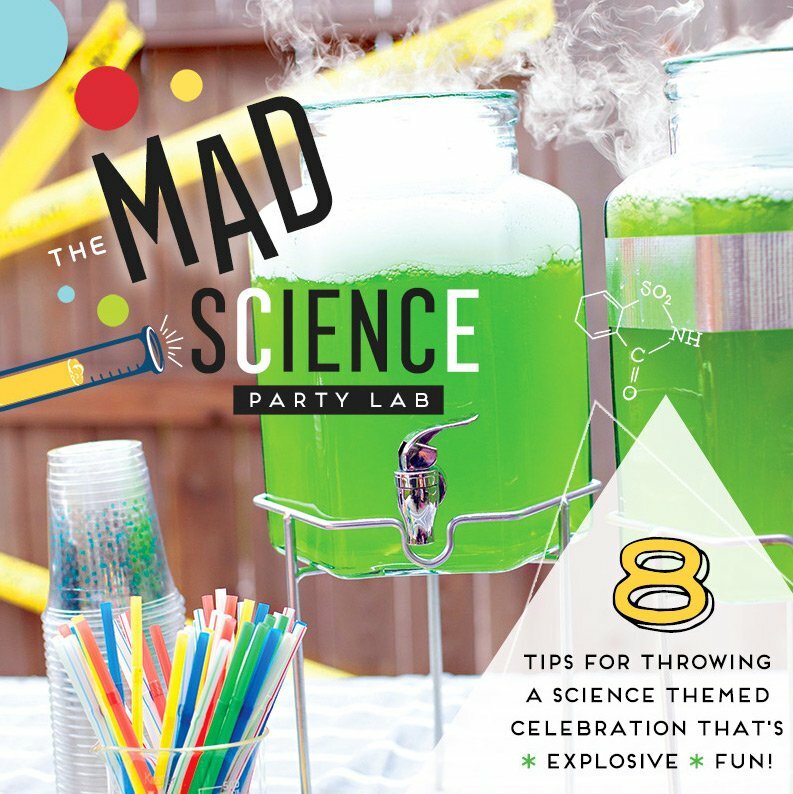 Everyone loves a good party—so let’s get this one started! love it, I can see a Halloween twist to this too! Thanks for sharing this! 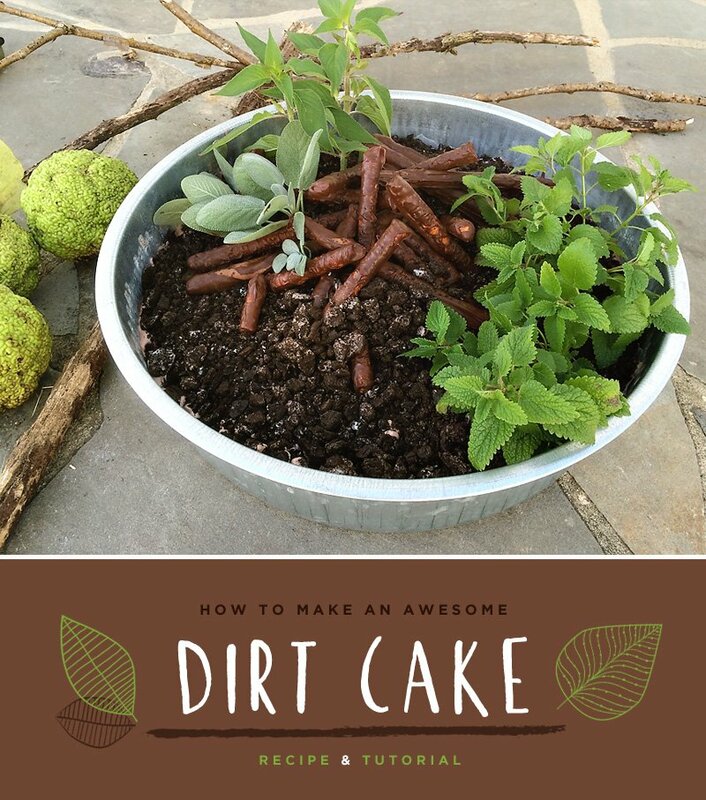 Love your dirt cake making idea. This is really hilarious to me. It looks yummy and haven’t seen such wonderful cake yet in my whole life. Nowadays, it is not difficult to be familiar with new recipe but recipe which you have shared here is unique mind blowing. I got surprised to see it. Looking it first, I don’t believe that it may be cake. This looks different and I’m sure everyone would love to eat. Thanks for including the easy instruction too, it will be easy to prepare. Pip Pip Hooray sounds like an awesome app, hosting a party can always be so overwhelming. 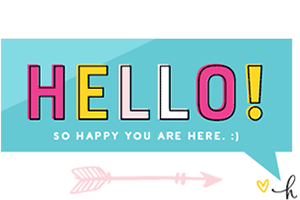 With this app i´ll definitely be happy to host more! The mud cake looks awesome as well! Cake looks like dirt for real! More compliment than an insult honestly ;).